Why roast peppers? Roasting brings out their sweetness and the roasting gives them a different, richer flavor. Roasting your own peppers taste so much better than the store bought peppers in a jar, and it really isn’t difficult at all. The traditional Italian method of flattening and removing the seeds before roasting is actually the easiest method. I also roast my peppers using the same method on my gas grill in the summer. Start by removing the stem and cutting off about ¼” from the top and bottom of the pepper. Remove the seeds from the inside. Slice one side of the pepper and lay it flat with the skin side down. Slice with a sharp knife along the inside of the pepper to remove the white ribs and remaining seeds. 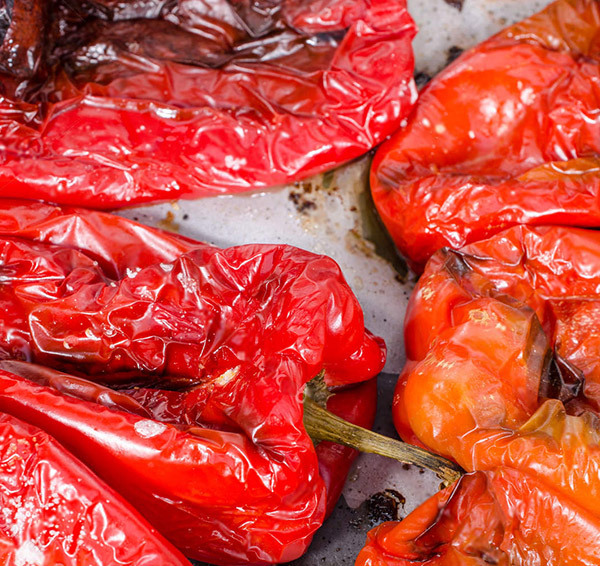 Arrange the flattened peppers on a foil-lined baking sheet with the skin side up. Flatten the peppers with your hands. The flattening will ensure even browning of all of the skins. Roast the peppers under the broiler until the skins are charred but the flesh is still firm. Remove the pan from the broiler and wrap the pan tightly with foil to allow the peppers to steam for 20 minutes. The steaming will loosen the skins and when the peppers have cooled, you can easily slip off the skins. Gently scrape off the blackened skins. The peppers will be soft and sweet and can be eaten immediately or stored in your refrigerator for a couple of days. Peppers can also be roasted whole by placing them directly on your grill or even on the burner of a gas stove. When the skin darkens and blisters, turn the pepper until all sides are cooked. Then place the roasted peppers in a plastic bag to steam for about 5 minutes. The steaming will allow you to peel the peppers easily. The roasted pepper can be sliced for a great condiment for sandwiches or blended to make a sweet, flavorful pasta sauce. Try blending them with tomatoes to make an excellent soup.